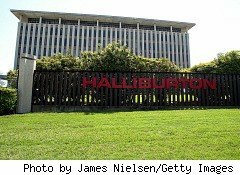 Halliburton (HAL) shares jumped 12% in Wednesday trading, as company officials reassured the market that it's indemnified against potential claims and expenses arising from BP's (BP) massive Deepwater Horizon oil spill in the Gulf of Mexico. Halliburton served as the cement contractor on the ill-fated Deepwater Horizon oil rig, which exploded on April 20 and again April 22, killing 11 crew members. The disaster continues to spill millions of gallons of oil into the gulf and has run up a $990 million tab for the recovery costs so far. Since the explosions, Halliburton has seen its shares fall 36.5% to $21.15 at the close Tuesday, as questions emerged about the role the company played in the nation's largest oil spill, now easily eclipsing the Exxon Valdez spill in 1989. But during a conference call with analysts Wednesday, Mark McCollum, Halliburton's chief financial officer, said: "We believe we are fully indemnified for all potential claims and expenses, as it relates to bodily injury claims or damage to the environment." In addition, the company has a $600 million general liability insurance program and $1.3 billion in cash and short-term securities, he added. Apparently investors were pleased. Shares of Halliburton soared as high as $23.84 during intraday trading Wednesday and closed at $23.69, with double the 30-day average trading volume. Concerns about potential liability payouts apparently weigh greater on investors' minds than the loss of business Halliburton is currently facing and will face in the coming months in the Gulf of Mexico. The Gulf of Mexico accounted for $221 million, or 13%, of Halliburton's North America revenue in the first quarter. And of this pool of money, approximately $143.7 million, or 65%, comes from deep-water activities in the Gulf. The company, overall, generated $3.8 billion in total revenue in the first quarter, so its deep-water Gulf of Mexico activities are a drop in the barrel. The company expects its current deep-water work in the Gulf of Mexico to be suspended for at least six months, maybe longer, and it won't be able to pull new drilling permits for a similar duration of time, based on new Minerals Management Service rules. Overall, it may take Halliburton 12 to 24 months before its Gulf of Mexico operations are running at half the level they were before the BP spill. In the meantime, the company hopes to reallocate 2,200 affected Gulf workers to its other operations in North America and around the globe, says Tim Probert, Halliburton's president of Global Business Lines and Corporate Development. Says Probert: "We have a robust North American market."